The story of Luci Ancora & Ristorante Luci is a romantic one, as all good Italian stories are. With a passion for food and wine, cultivated by the experience of living in and around Naples, Italy, the Smith Family began their coincidental culinary and viticulture education when Kennedy was in office. It was the 1960’s. With an opportunity to live abroad, newlywed Al & Lucille Smith packed their things and moved to Via Petrarca, Naples, Italy, the scenic neighborhood just outside the bustling city center overlooking the beautiful Bay of Naples. For 11 years, Al & Lucille spent their time raising their growing family of six children immersing themselves in the Italian way of life. Enjoying friends and family amidst seasonal cuisine and a veritable selection of wine – these times around the table would be the inspiration for what would later become the Luci Restaurants. Upon returning to Saint Paul and eventually retiring, the Smith Family desired to recapture what they had experienced during those years in Naples. The philosophy of sourcing the best possible ingredients alongside experience and patience was and remains the focus of Ristorante Luci. Inspired by their mother’s cooking and kitchen, soon daughters Maria, Daniela, and Anna were helping put the finishing touches on the menu and wine list with son, Stephen, perfecting technique and creating new ingredient inspired recipes. After months of transforming what was previously “The Club” bar, narrowing down menu selections, and finalizing the wine list, Ristorante Luci was ready to offer fresh pastas, wild, line caught fish, and one of the first Tasting Menus in Saint Paul. The year was 1988. Complete with house made bread and desserts, Ristorante Luci soon garnered local attention and loyalty, with admiration from unexpected places. As demand exceeded supply of the 40 seat Cucina, the Smith Family took the opportunity to offer more to Saint Paul. Due to space limitations of Ristorante Luci’s building, expansion was not an option at the 470 Cleveland Ave location. Coincidentally, the property kiddy corner from Ristorante Luci was for sale. The Smith Family broke ground in 1996 for what would become Luci Ancora, an Encore of Ristorante Luci. Built from the ground up, the second space nearly tripled the kitchen, more than doubled the dining room, and offered an open atmosphere that contrasted the cozy space some had grown to love at Ristorante Luci. With large picture windows framing the grassy knoll of St. Catherine’s University, guests could now enjoy dinner with family and friends up to 85 at a time near a wood burning fireplace. With the same philosophy of beginning with the best available ingredients, prepared with experience, Luci Ancora’s new head chef, long time collegue and friend Jim Kohler, took the reins, preparing dishes incorporating international influences while remaining true to the Italian approach of simple, flavorful cuisine. In 2016, the Smith Family decided to close Ristorante Luci. It was a decision that let them focus on one location and spend more time with their families at home. 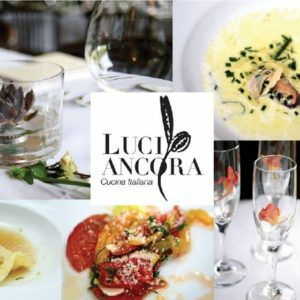 Today, Luci Ancora remains true to the initial endeavor, offering fresh, seasonal Italian influenced cuisine showcasing handmade pastas, local produce and sustainably raised and harvested fish, seafood, along with specialty cuts of meat. The four course tasting menu is available nightly as well as an optional wine flight. We look forward to serving you and your guests soon.